With spring only one month away (not that we're counting), we're more than ready to swap out our lace-up boots for something lighter but equally as practical, and thanks to TOMS' handiwork with Shabby Chic, we just might have found the perfect match. These super-comfy daytime flats and wedge sandals have the markings of a truly great shoe — soft canvas, adorable florals, and a cushy insole. In essence, it's the kind of shoe that your feet will thank you for after a whole day out and about running errands (or brunching, whichever). And in case you're looking for a little dose of good karma, here's your chance. A portion of the sale proceeds benefit not one, but two, worthy causes: TOMS' One For One program and Shabby Chic's efforts with Upward Bound House. 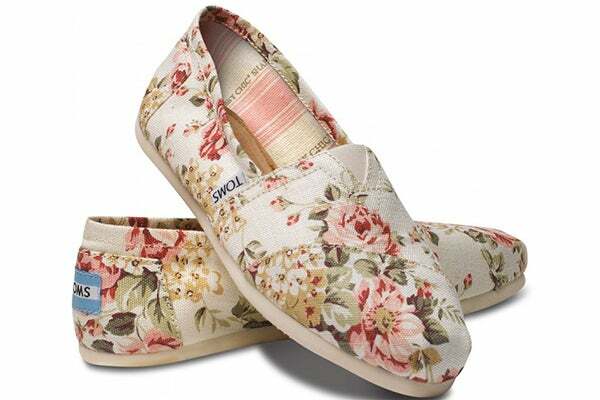 So, go on — in the name of inducing good karma, grab a pair of these feel-good classic canvas shoes now at TOMS.